JUST QUIETLY formed together like the pieces of a perfect puzzle. The Gladstone based band has only been performing since October last year, but is already creating a popular name for themselves. Four local musicians make up the newly fashioned team - husband and wife Mark Hodge (bass), Fiona Hodge (drums and vocals), Gary Annett (vocals and rhythm) and Brad Fry (lead guitarist). Initially, Brad said getting together was all pretty user-friendly. Mark and Fiona are married, Gary lives across the road and Mark met Brad after doing prac teaching at the school Brad teaches at. "You find out someone plays music and you think, oh, we should jam," Brad said. Just Quietly covers a range of music from old-school covers to new hits. But it's the old classics that the band said usually get the crowd pumping. "Because we got Fiona and Gary and they both sing, we can vary the music quite a bit," Brad said. "We can have female vocal songs like Alanis Morissette, Pink and Rhiannon. "But it's the timeless songs that stand out." Mark said Rock Around the Clock and Blue Swede Shoes are often some of the best crowd pleaser's around. "The old pub rock stuff," he explained. As they say, music makes the world go round and for Mark and Brad, this is certainly the case. "I think music is an awesome way to connect with people," Brad said. "Big bands that play in a country that don't even speak the lanuage and the crowd sings the song - it's connections like that." Mark said it's amazing when you see everyone jumping around and dancing. Both Mark and Brad are teachers at local Gladstone schools, each with children of their own. But before their teaching days, Mark worked as a carpenter and Brad as a plumber. With this in mind, the guys thought this gave the band an even bigger marketing tool. "We can fix your house - hang a door, fix a toilet and do the gig," Brad laughed. But the guys are always prepared when it comes to the next gig in town. When asked where they wanted to take the band in the future, the guys seemed content to go with the flow. "With our music - we'll just follow it - if it's just gigs, it's just gigs and we're happy with that," Brad said. "It would be nice to go on a world tour though," Mark laughed. LOCAL talent is booming in Gladstone and newcomers to the band scene, Just Quietly, agree that the region is full of skillful musicians. Just Quietly lead guitarist and bass player Brad Fry and Mark Hodge believe the region has plenty of local talent, especially soloists of a young age. Brad said it's amazing how many soloists are in town. "People are prepared to get up there and just sing," he said. Some of those local faces, well-known on the music scene include Nathan Bedford, Benny Oliver and Jack Blandford. "It's a hot pot of that," Brad said in relation to Gladstone music talent. "When we went in Battle of the Bands - the talent quest before that had the junior section. "They had a little 11-year-old girl and she just gets up with her guitar and sings." Brad said it was simply an amazing sight. "The amount of people just there to play by themselves was just amazing." When it comes to sharing the talent with residents, the local pubs seem the way to go. But Brad said it seemed to be the soloists that were hot on the current market. "I think there's enough places but I think they're just happier to get soloists. "It's less equipment and less to set up." Just Quietly bass player Mark Hodge said in a way it is a shame that many of the pubs are not set up for a band. "I think a lot of people would rather a band but they're still happier with a soloist. "Personally, and I know a lot of friends, that would rather go to the pub and see a band rather than someone just playing a guitar." In saying that, the guys agreed that the popularity just seems focused on soloists at the moment. "On the other side though," Brad said. "You got Dicey's and they have a stage and you got The Yacht Club - they've got a new stage - so there are places." 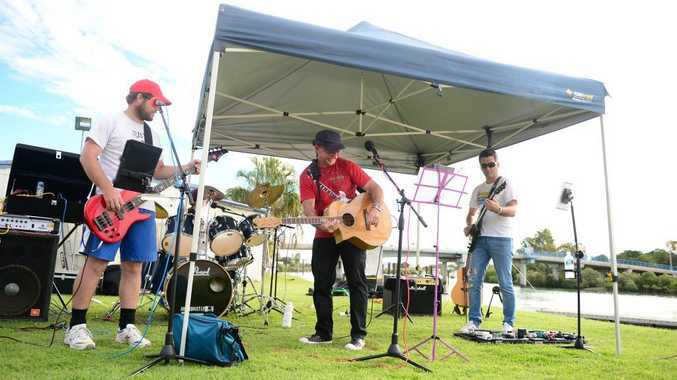 Though proving successful so far, the band is still fairly new on the scene of Gladstone talent. And Brad and Mark explained that things can be challenging when trying to break into the industry. "It's a funny thing," Brad said. "It's like trying to get across a busy roundabout - when you're in your band you wait and wait and then you jump in, because they seem to have that roster." Brad related it to a water current. "You got to just try and get in. "You have to jump into the current," he said.